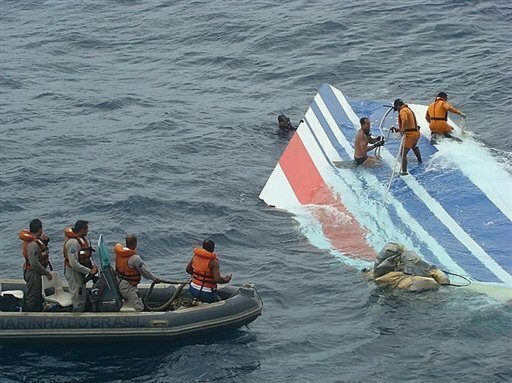 On June 1, 2009 Air France AF447 disappeared in the Equatorial Atlantic Ocean en route from Rio de Janeiro, Brazil to Paris, France. During June 6-19, 2009 bodies and debris from the aircraft was recovered floating in the equatorial ocean. A total of four searches, coordinated by the Bureau d’Enquêtes etd’ Analysis (BEA) were carried out to locate the crashed plane, during which ocean models were used in third and fourth searches to assist the search by predicting the paths of floating bodies and debris recovered many days after the accident backwards in time to the time of the accident. We are the modeling team who applied the global-regional nested FVCOM model to predict possible locations for the crashed plan for the fourth search, and results were made available for the Woods Hole Oceanographic Institution (WHOI) REMUS autonomous underwater vehicle (AUV) Operations Group who successfully located the aircraft debris field in April 2011. The global-local nested FVCOM system, equipped with the data assimilation of SST, SSH and drifter/float-derived currents, was capable of predicting the possible location of AF477 in the western equatorial region of the North Atlantic Ocean. With a success in reproducing the observed tracks of drifters deployed in June 2010, the model suggested that the optimal interpolation data assimilation approach with a correlation scale of 50 km was able to resolve the meso-scale variability of surface currents in the accident area. Applying this correlation scale to assimilate the drifter- and float-derived currents into the model with the assimilated surface mixed layer, the model helped narrow the search area in two possible locations. 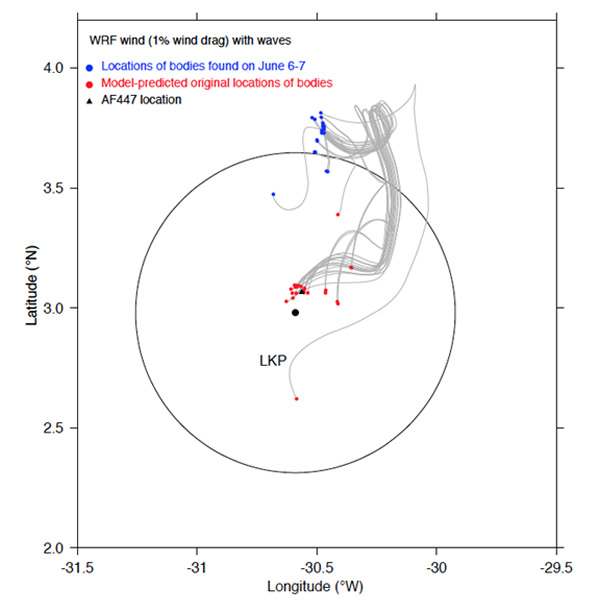 The best results were obtained by using the WRF winds and a direct wind drag of 1% on the floating bodies (See Figure). The detailed report was written into a paper and published on Ocean Dynamics-a peer reviewed ocean journal. Click here to view the paper. Figure: Backtracked June 1 locations of the bodies. The tracking was done by the ocean currents with inclusion of surface waves and 1% direct wind drags on the bodies . The last known position (LKP) is in the center of 40 nm rang ring. Blue dots were locations of individual bodies found after accident. Red dots were the model-predicted original locations of the bodies within five minutes when the accident happened. Black filled triangle was the final location of AF447 detected by the AUV.